Zimbabwe has been in a state of acute political and economic crisis since 2000. Although the causes of the crisis are multifaceted, the predominant view is that there is a breakdown in the rule of law and observance of human rights by the state that is faced with overwhelming pressure from civil society, opposition parties, and the news media to embrace democratic reforms (Ranger 2005; Zaffiro 2002; Phimister and Raftopoulos 2004). The state and its critics have fought their information and ideological battles not only through the old analogue or traditional media of radio, TV, and newspapers, but also the new digital media, such as the Internet. 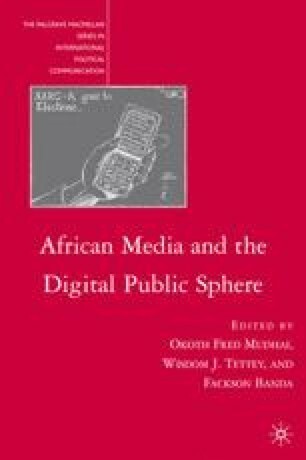 The focus of this chapter is on the role played by the Internet in democracy in Zimbabwe. It begins by tracing the development of the Internet and the emergence of various forms of digital interaction and information sharing occasioned by the new medium in Zimbabwe. Next, the Web sites of Newsnet, Kubatana, and New Zimbabwe.com are analyzed in terms of their content and form. Newsnet is the subsidiary of the national public broadcaster, the Zimbabwe Broadcasting Holdings (ZBH). Its major task is to provide news and current affairs programming to ZBH radio, TV, and online services. Kubatana is a civic organization involved in cyber activism to highlight democracy and human rights issues in the country. Jensen, M. 2002. The African Internet: A Status Report. African Internet Connectivity, September. http://www3.sn.apc.org/africa. Jensen, M.. 2004. “The Rise of The Telecenters and Cyber Cafés in Africa.” Acacia Initiative 9 September 2004. http://www.acacia.org.za/jensen_articles.html. Moyo, J. 2007. “Price War: Zanu PF Comes to the End of the Road.” Zimbabwe Independent Newspaper, July 6, 2007. http://www.theindependent.co.zw.